A University of Maine at Presque Isle Fine Art professor spent several months this summer and fall working in locations throughout Europe after being awarded three art residencies—two of them with fellowships—to focus on her art work. Heather Sincavage, UMPI Assistant Professor of Fine Art, participated in art residencies at the Arteles Creative Center in Hameenkyro, Finland; at the Can Serrat International Art Center in Barcelona, Spain; and at the Nes Artist Residency in Skagastrond, Iceland. Based on the strength of her application and artistic merit, she was awarded fellowships from both Arteles and Can Serrat. Sincavage’s journey began with a one-month residency in July at the Arteles Creative Center, an international residency program where 10 to 12 artists reside at a time. The center’s cross-disciplinary focus brings together a wide range of artists into one location to work on their many different mediums. According to the center’s website, it is one of the most international creative residency programs in the Arctic area, welcoming more than 80 selected visual artists, curators, musicians, writers, performance artists, photographers and designers per year. The Creative Center is run by Arteles, a non-profit organization. While in Finland, Sincavage focused her artistic energies on molded paper, wood, graphite, and silver leaf. One piece she couldn’t take with her was her installation “The Sentinels,” in which she applied silver leaf circle shapes to 13 birch trees in the nearby woods. Themes of inward reflection and the circular form recurred in several pieces Sincavage undertook throughout her residencies. At the conclusion of her time at Arteles, her work was featured in the exhibition “Sideshow” at the Heiska Historical Homestead in Hameenkyro. From Arteles, Sincavage traveled directly to Barcelona to spend the month of August at Can Serrat International Art Center. According to its website, Can Serrat was founded in 1988 by a group of 12 Norwegian artists whose primary purpose was to create an exciting working and living space for themselves and others. In addition to its many interior and exterior spots in which artists can work, Can Serrat is surrounded by natural beauty—it is located at the foot of Montserrat, a mountain mass which is unique due to its spectacular natural forms. The area, very popular with hikers and climbers, has been a Natural Park since 1987. During her time in Spain, Sincavage continued her work on paper and with mirrors, but expanded her canvas to the actual walls and floors of her studio space. 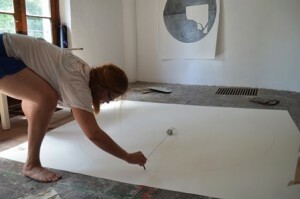 Again her connection to place served as inspiration for one of her pieces, “Reflecting Pool.” In it, a circle created from graphite and silver pencil on paper is counterbalanced with pieces of a mirror carefully placed on the floor, which reflects back the circle—” in a sense, a complete cycle. The format is an exact reference to the structure of a reflecting pool I passed every day,” Sincavage explained. Upon leaving Can Serrat, Sincavage next traveled to Iceland for another month-long residency, this time for the month of September at the Nes Artist Residency. Located in northern Iceland, with its studio spaces right on the water in a former fish processing plant, Nes works with visual artists from around the globe, generally about a dozen at a time. Nes was founded in 2008 and is a member of the Remote Network of Artist Residencies in the Nordic and Baltic Regions. According to its website, the main goal of the residency is to provide an opportunity for international exchange, artistic cross-pollination, and to create an open possibility for collaborations. Now back from her travels, Sincavage is refining the pieces and themes she worked on during her residencies and expects to display some of her work in an exhibit next spring.